Want to more about our Design Process? Check it out on our page here! 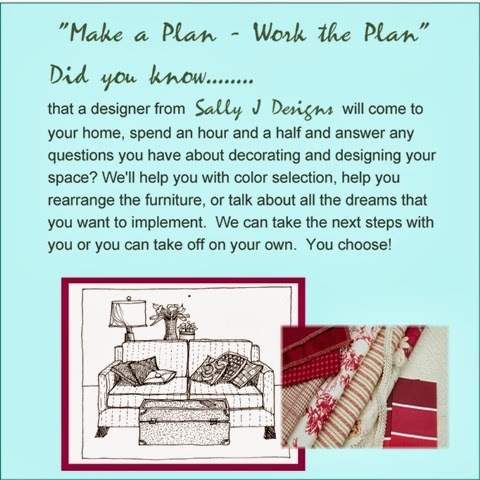 that a designer from Sally J Designs will come to your home, spend an hour and a half and answer any questions you have about decorating and designing your space? We'll help you with color selection, help you rearrange the furniture, or talk about all the dreams that you want to implement. We can take the next steps with you or you can take off on your own. You choose! We love doing design plans for kitchen and bathroom remodels. Here are a few pictures from one of our projects from last year. Thanks Kathy, for allowing us to complete this beautiful bathroom for you!